Growing up with Disney in a Disney family meant that animation movies have, and always will, hold a special place in my heart. As a kid, my love of animation wasn’t limited to Disney. At the library, I would reach for any fun-looking animated VHS or DVD, especially if it included animals or magic. Around 3rd grade, I stumbled upon a movie that had a black cat and a witch on the cover and immediately took it home. Kiki’s Delivery Service was my first introduction to some of my favorite childhood and adulthood movies by Hayao Miyazaki and it’s still my favorite today! My top three movies might not be the most popular Miyazaki movies from Studio Ghibli, but these movies are my go-to movies. I admit that I also have quite a few plushies and figurines from these movies in my apartment! Plus, the soundtrack of these movies are just amazing! Kiki’s Delivery Service is a coming of age story about a young thirteen year old witch named Kiki who leaves her hometown with her cat, Jiji, to do her required year of ‘training’ to be a witch. Kiki finds herself working as a delivery girl for a bakery and things seem to go well for a while. However, Kiki ends up losing her magical abilities and needs to rediscover herself and who she is in order to get them back before it’s too late. Not only was this my first Miyazaki movie, but it has all the classical elements that Disney movies tend to have. Perhaps that’s why it takes first place! Plus, every moment was enjoyable and it was overall a pretty straightforward movie. Simple, beautiful, and a fun story that includes magic, animals, and humor. What’s not to love? Howl’s Moving Castle is about a young girl named Sophie who’s life is turned upside down when she meets a wizard named Howl. Another old witch takes issue with Howl’s interaction with Sophie and puts a spell on the young girl to turn her into an old woman. Sophie goes on a journey to find Howl and they work together to try to break the spell that’s been placed on her. Complex and a little odd, it’s still a fun love story. Plus, the characters are all unique! My personal favorite is the fire demon, Calcifer, because there’s so much that goes into his character and he’s also funny! There was a lot of emotion in this movie and overall it was well executed. Also, it’s particularly special because my husband and I heard the soundtrack together early on in our relationship and decided together that the theme song – “Merry Go Round of Life” – was going to be the song for our first dance. About eight years after that declaration, it came true! Two young girls, Satsuki and Mei, move into a new house in order to be closer to their ill mother who is in a nearby hospital. While living there, they find little magical creatures in the forest. 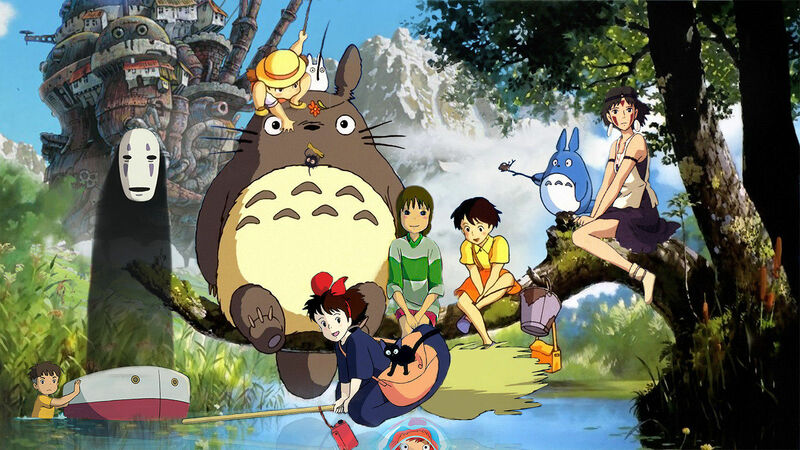 They follow the creatures to ultimately find Totoro and go on fun adventures. Not only is Totoro super cute and adorable (can we just hug him? ), but the story is whimsical and heartwarming in a way. There are moments when the creativity was definitely a little more odd (i.e. that cat bus with way too many legs to make me feel comfortable), but there were so many iconic and unique moments that aren’t easily to be forgotten. Plus, if you’re into looking at interpretation, there’s a lot of different ideas and thoughts on what Totoro represents or what it symbolizes. If you’re into complex movies or movies that have a deeper meaning to their plot, this movie is one for you. Are you a Miyazaki fan too? What are your top three favorite movies and why? Let me know in the comments below! Have you heard of Mary and the Witch’s Flower? It’s directed and produced by men who used to be lead people with Studio Ghibli. I like Kiki’s Delivery Service and Spirited Away more, but I thought it was still a good movie :).